14th H. H. Maharaja Madhavrao Scindia Memorial Cricket Tournament- 2016 was played from 30th March to 3rd April 2016. The schools which participated in the tournament were The Doon School, Daly College, Indore, MNSS Rai, YPS Patiala, Modern School Delhi, DPS Mathura Road, DPS Agra and the host school, The Scindia School. The 1st Semi Final was played between Modern School VS YPS Patiala, and the winner was Modern School. The 2nd Semi-final was between DPS Mathura VS MNSS Rai and the winner was DPS Mathura Road. 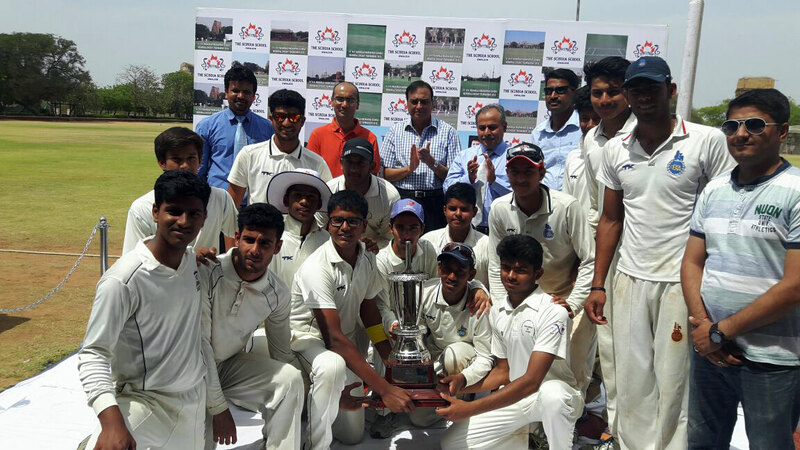 The final match was played between Modern School VS DPS Mathura Road and it was won by DPS Mathura Road by 15 runs. The Principal, Dr Madhav Deo Saraswat welcomed the Chief Guest on this occasion. The Chief Guest was Mr. Anay Dwivedi, IAS – Commissioner, Municipal Corporation Gwalior and the Guest of Honour was Mr. Prashant Mehta, IAS, Vice President, MP State Cricket Association. Mr. Anay Dwivedi congratulated the winners and noticed that the teams were goal oriented and played like good professionals. Best Bowler of the Tournament: Vikash Hooda (MNSS Rai). He took 8 wickets in 4 matches. Best Batsman of the Tournament: Samarth Seth (Modern School). He scored 222 runs in 5 matches. Best All-rounder of the Tournament: Ankit Chhillar (DPS Mathura Road). He took 99 runs and 5 wickets in 5 matches. It was noticed by the entire Scindian fraternity and the coaches from various teams that this year’s organization was very meticulous and outstanding. The credit for such a precise and detail oriented implementation of the entire programme goes to Mr Naman Saraswat, Dean of Sports.